I can still remember when Petr Eben’s music was a common, almost indispensible part of the programmes of organ concerts in this country. The programmes that many students and graduates of the country’s conservatories and of the academies in Prague and Brno began with Bach, continued with Franck or Reger, and then ended with Eben are rather seldom heard today. 2017 was the tenth anniversary of Eben’s death, and we have seen something of an ebb of interest in his music, although this is a natural consequence of the breadth of repertoire now available and of the fickleness of the public. From the start, the source of the popularity of Eben’s organ music was the composer’s perfect grasp of the specific nature of organ sound and the total naturalness and compositional mastery with which he combined classical forms and basic, pleasing sonorities with a successful attempt at modernity, also usually supported by a programmatic idea that allowed listeners to grasp the music’s content even at first hearing. That is why Eben’s compositions were so often performed at home and abroad and why many recordings of his most important cycles have been issued. In fact, Eben’s entire organ legacy has been recorded several times. In spite of the current circumstances, I am coming out with a new CD of works that have already been recorded several times, but with a rather different focus from what has been usual. The initial impulse for preparing this CD was my thought that the first big Eben cycle Sunday Music (Nedělní hudba) still clearly embodies many elements of Romantic musical thinking, but Czech performance tradition has not preferred the performing of this music on the big Romantic-era organs on which I think the work can sound most stylistically satisfying. In reality, the composition is a formally free organ symphony. Oddly enough, however, there is no recording in existence of Sunday Music played on a Romantic-era organ. My explanation for the compatibility of the ideal sound world of Sunday Music with Romantic-era organs is that Petr Eben was already having regular encounters with the king of instruments at an early age, specifically with the Schiffner organ at St Vitus’s Church in Český Krumlov. The organ must have provided inspiration for his improvisations and later for his composing. Despite the conscious or subconscious inspiration of the Romantic-era organ, Eben’s expectation from the beginning was that his music would be played on modern organs of the kind being built when the work was composed in 1957/58, and which were appearing in increasing numbers; in fact, such organs were sprouting up everywhere abroad. Older instruments had either been destroyed during the war or were falling into a state of disrepair, and the Romantic-era organs, unlike their Baroque counterparts, were often even regarded as virtually worthless. Whatever the composer may have thought of these instruments, there was little that could be done to save them. Paradoxically, an organist who now wishes to find an ideal instrument for performing Sunday Music in the Czech Republic is faced with a very difficult task. One cannot easily get around the composer’s requirements. We need an organ with three manuals and reed stops, a sufficient range of notes, and a case fitted with swell shutters allowing the continuous dynamic shading of colours. If we want the organ to have the parameters for the Romantic-era sound, we find no Czech instruments that are suitable even among the historical organs. The only instrument that seems to me to be appropriate is actually the Schiffner organ in Český Krumlov, but unfortunately it has been in an unplayable condition since its last repair. For this reason, for Sunday Music I have chosen a superb instrument in a town in the Ore Mountains on the Saxony side of the border. The organ at St. Anne’s Church in Annaberg-Buchholz was built in 1884 by Walker and Son, a leading European company at the time. In 1995 the company Eule from Bautzen did a first-class job of restoring the instrument. Eben’s second work for solo organ, the cycle Laudes (1964), is of major importance in the context of the Czech organ literature. It is here that the composer makes his furthest departure from straightforward tonality and a neoclassical means of expression, at least as far as his solo organ works are concerned. He also took inspiration from such fashionable elements as the principles of spectral music or reverberations of jazz. He nonetheless remained true to himself, and he buildt on the expressive quality of Sunday Music with the beauty of melodic freshness and almost brutal defiance in places. It should be remembered that while the lovely highpoint of Sunday Music is a quote of the Salve Regina in the Finale, which moved to tears many of those present at the premiere performance given by Milan Šlechta, the backbone of the cycle Laudes consists of quotes from Gregorian chant. The performer of the premiere of Laudes was another iconic organist, Petr Sovadina. For my present recording of Laudes, I chose the wonderful organ at the Jesuit church in Brno, built in 2014 by the Swiss firm Mathis. The instrument is unique in the context of this country mainly in that although it is conceived as universal, i.e. intended for all organ literature, it embodies striking stylistic elements in the form of an irregular, sophisticated tuning that coexists well with the cleverly chosen range of sounds, giving the organ plenty of flexibility instead of making its sound completely even in every tonal situation, and therefore unpleasantly sterile. I also employed some unusual sound effects and took advantage of the transparent clarity of the sound inside the church, something that is absolutely necessary, especially in the complicated chordal and polyphonic writing of Eben’s Laudes. The Sweet Chains of Love is the fifth movement of Eben’s late cycle for solo organ and speaker based on Comenius’s Labyrinth of the World and Paradise of the Heart. Petr Eben was himself an organist, of course, although he studied piano and composition at the Academy of Performing Arts in Prague, but at many of his concert performances, he played exclusively his own compositions or improvised. Labyrinth of the World and Paradise of the Heart was created as an improvisation that was gradually codified into a score. The movement titled The Sweet Chains of Love is a typical example of Eben’s music from a time when the composer was no longer making any attempt at modernity; this is beautiful, tonal music that treats a folk song and then a Protestant chorale melody with simple directness that is almost enviable for many people. Eben’s Hommage à Dietrich Buxtehude is one of the many organ compositions he wrote on commission. Its subtitle is Toccata Fugue. It was composed in honour of the 350th anniversary of Dietrich Buxtehude’s birth in 1987, and Martin Haselböck gave its premiere. I took a long time deciding which organ to choose. I had in mind Dietrich Buxtehude and the big churches in Lübeck where he played. Eben was attempting not only to use the two familiar themes as points of departure, but also to create a unique world in a modern manner using the old north-German motivic and stylistic method of composing. There were also the absolutely essential requirements of a mechanical tracker action, a large acoustic space, and probably a neo-Baroque layout, because an original organ from Buxtehude’s time or a replica of one would not suit Eben’s modern transformation, especially with respect to tuning. I was not sure, so I acquired a some recordings made on important instruments just to try them out. Surprisingly, the clear winner turned out to be an organ with pneumatic action but also a partially neo-Baroque layout, also proving that organs that were scorned until recently can offer organists absolutely unexpected possibilities for expression. The CD thus concludes with an organ built by the no-longer existing, generally little known company W. Siemann, which was active in Bavaria before the Second World War. The organ builders’ opus 498 was constructed in 1938 at Saint Peter’s Parish Church in Freising. 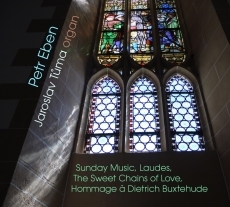 The three organs chosen for recording selections of Petr Eben’s organ music are indispensable individuals among the representatives of the king of instruments. It turns out that even music that we simply regard as “contemporary” is not free of sometimes substantial, limiting demands for the peculiar, clearly defined character of these individual instruments. But this is gratifying. The fact proves at the same time that the life of the important works of original composers has no end. Many are passing through the history of music solitarily or in groups, and they definitely will not be gathering dust in the archives.